Nana Addo Dankwa Akufo-Addo, flagbearer of the New Patriotic Party (NPP) has taunted President John Evans Atta Mills once again saying the President has not been able to fulfill a single campaign promise since his election as President of Ghana. Nana Akufo-Addo made the statement at Madina, a suburb of Accra at the weekend when the NPP held a mini rally by the Madina Abokobi Constituency. Some of the party’s stalwarts were all present at the rally which forms part of the NPP’s strategy to assess its preparedness for the 2012 general elections. Nana Akufo-Addo said former President John Agyekum Kufuor laid a solid foundation for accelerated development of the country but President Mills-led National Democratic Congress (NDC) government has come to put aside all the good things of NPP administration. “I know the level where President Kufuor took this country to but it is not the exact continuation that we see today under President Mills”. Turning to the NPP family, Nana Akufo-Addo said it is not true that he has already made his mind about who was going to be his running mate for the 2012 contest saying he is ready to partner whoever is selected by the party. He also said that since the NPP amended its constitution to enlarge its electoral college, there has been renewed energy by the members of the party to work harder and added that the only hurdle left to clear is select the party’s parliamentary candidates without any rancor so that Ghanaians would know that the NPP is ready to resume the reins of government. Sheikh IC Quaye, former Greater Accra Regional Minister and MP for Ayawaso Central said the NDC does not have any real issue to talk about that is why they are engaging in smear campaign against the NPP flagbearer. He said Nana Akufo-Addo can never be a drug baron as being peddled around by the NDC and called it wicked and dirty. Ken Agyapong, MP for Assin North said despite claims by the NDC that it was working, the reality on the ground is that that ruling party has failed woefully and the situation of Ghanaians are worsening by the day. 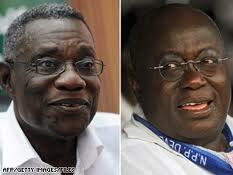 Scores of NPP stalwarts took turns to address the enthusiastic crowd.